Communication for Development (ComDev) is about seeking change at different levels including listening, building trust, sharing knowledge and skills, building policies, debating, and learning for sustained and meaningful change. 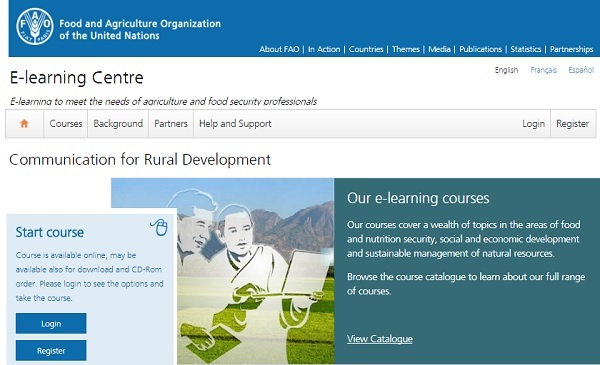 The free FAO e-learning course entitled "Communication for Rural Development" provides an overview of the ComDev approach that aims to address the knowledge and information needs of rural stakeholders and to facilitate their active involvement in development initiatives. FAO ComDev activities aim at supporting development policy processes, enabling rural people’s access to relevant information and fostering social dialogue through the design and implementation of appropriate ComDev strategies. To enhance experience sharing, advocacy and collaboration among practitioners and projects engaged in communication for rural development, a number of regional web based platforms have been created. Among them, it is worth metnioning the following platforms: YenKasa - in Africa, ComDevAsia - in Asia, CCComdev - in Philippines, Family Farming Knowledge Platform. All them facilitate the exchange around research activities, methodologies and learning resources in ComDev. Following the results of the 2014 Forum on Communication for Development and Community Media for Family Farming, FAO is presently partnering with academia, research institutions, governments, UN agencies and farmer organizations to foster policy dialogue and collaboration in the field of Rural Communication Services (RCS). Participatory communication processes, community media, and local appropriations of Information and Communication Technologies (ICTs) have proven to be essential to overcoming RCS limitations and increasing the self-reliance of millions of poor farmers worldwide. Periodically, the FAO E-agriculture platform launches global e-Forums to discuss and complement the outcomes of the regional and (inter)national consultations about the role ICT and Open Data play in RCS as well as in achieving the Sustainable Development Goals. [Register and participate (till 14 July 2017) in e-forum on ICTs and Open Data in Agriculture and Nutrition running on the E-Agriculture Platform]. A recent study "Inclusive Rural Communication Services. Building Evidence, Informing Policy" (2017) - developed by FAO and five universities - provides recommendations on how to systematically build evidence that can orient governments, institutions and organizations in establishing and operationalizing inclusive RCS. The course aims to guide users in designing and implementing communication strategies for agricultural and rural development initiatives, combining participatory methods with communication processes, media and tools, ranging from community media to ICTs, best suited for a specific context.